Yes, this is still the no-so-Weekly Word. But this word will pretty much define 2013 if only because it is one of the words that the great mass of unwashed people totally misunderstand. It is also a word you will hear bandied about by fools who imagine that if only there were no guns there would be no killing. Now, before I go on, I want to point something out. It is very easy to get wrapped up in what it says in the Constitution and the Bill of Rights and be arguing that the government can’t do this or that because of what it says there. I’m here to tell you – it does not matter what it says there. If the right of the people to keep and bear arms is infringed the consequences are not just that someone disobeyed a rule laid down by some far off founders. The consequences are the loss of civilized society. The reason this rule appears at all in our Bill of Rights is because the particular men who wrote the rules happened to know that rights are a priori, and inalienable, and they wanted desperately to create a civilized nation. Rights are the product of logical deduction. They do not come from the government. Got it? With that out of the way, let’s discuss the word of the year. What is a militia? A militia is NOT a professional army. 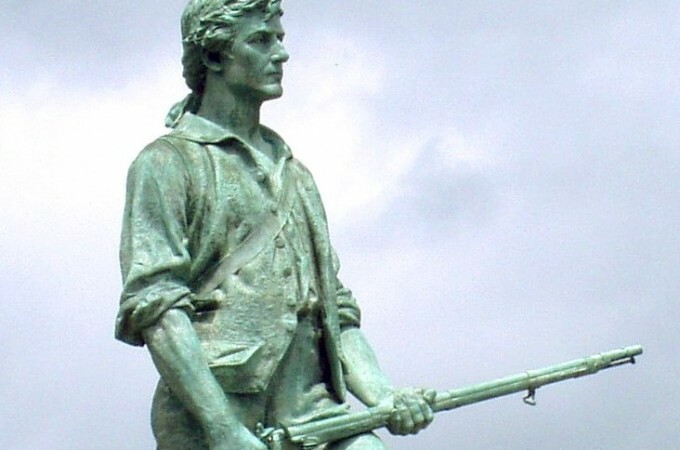 A militia is a group of average men and women, butchers, bakers, and candlestick makers, who pick up their arms, and come together in defense of themselves, each other, and their freedom whenever an emergency arises. While professional armies go all over the world initiating conflicts, militias never do. Their sole purpose is DEFENSE. They are average men and women defending themselves, their communities, and their way of life, from people who are threatening them. Some countries, like Switzerland, do not have professional armies at all. They DO NOT initiate conflict anywhere, but nevertheless stand ready to defend against it. They maintain organized militias. The purpose of a militia is not just to defend against foreign invasion, though. Their purpose is to defend not the state, but the people. And the people sometimes need to defend themselves against the actions of the state. Now, I’m sure in hindsight, if the men who founded this country could see what a mess has become of it, they would realize that prefacing the Second Amendment with the clause A well regulated Militia, being necessary to the security of a free State… was a mistake. They were logical men, so perhaps they wanted to make some of their reasoning plain, but truthfully, if you’re making a rule book, don’t bother. The reasoning will just be used to defend the unreasonable. I have heard numerous times in defense of “gun control” that the second amendment applies only to a militia and since the STATES don’t have ORGANIZED militias, nobody ought to have a gun. This can only come from one who is horribly naive about the history of their own nation or of mankind in general… but… sigh… I will say just few words about it. The words which are most key here are not state and organized but rather MILITIA and FREE – a militia being average ordinary folk protecting their freedoms from those who – external or internal to the current government (state) – are attempting to take those freedoms away. So rather, you can ask yourself this: Is a well regulated militia necessary to the security of a free state? Yes. And the Founders obviously thought so, too. That modern states don’t have these does not make this statement any less true. In fact, there ought to be agitation for the organization of militias and the dissolution of professional armies who murder and pillage all over the place in the name of “freedom” rather than calls for good people to be disarmed. Alas, I’m asking too much. Regardless, the argument that states don’t have militias is entirely irrelevant. And no, modern times are no different. I recently had a short debate with someone who told me that only a few states had the right to secede from the union and he would have to check which ones they were and get back to me. I told him something that applies here as well – They all have that right. It doesn’t matter one whit what’s written in their constitutions or in the US Constitution or anywhere at all. That right – like the one to keep and bear arms – is inalienable. And why it is in alienable is laid out quite nicely in the Declaration of Independence. It’s worth a read. As a bonus, watch this video of what always happens immediately before a holocaust as it is happening in Australia and will likely happen here, with or without a civil war.